Slot machines, also known as one-arm bandits, have been a popular form of gambling since the early 1900s. they are considered to be one of the easiest and relaxing form of gambling. It also happens to account for a large part of a casino's action and winnings. Example of a slot machine. To play simply drop in a coin, pull the arm and hope for a jackpot. You'll know when you've hit it by the loud bells and flashing lights. In any casino, you'll find a number of kinds of slot machines that offer three to nine reels, crosses, multiples, progressives, and specialty slot machines like 21, Keno, Video Poker, Poker Bingo, and Video Horse Racing and Dog Racing. 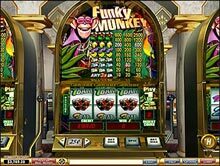 You'll find slot machines in a variety of setups including mechanical, video and now touch screen slot machines. You'll find all kinds of themes, jackpot sizes and coin denominations. Of all the gambling options available in a casino, slots tend to have a large house advantage at about 9%. Still they remain popular because they are easy to use, cheap and easy to maintain and require little or no skill. There is very little you can do to influence the outcome of a play at a slot machine. The best thing you can do is quit while you are ahead or, depending on your situation, cut your losses. You will collect larger winnings at larger denomination machines, however you must keep your head or you'll quickly gamble away more than your bankroll. Don't recycle winnings. Have a bank roll or budget and stick to it. Keep your winnings, but only gamble with your bank roll. It's always worth a try to play a couple of time with the large denomination and big jackpot machines. Many cost about $5 to play. Play a couple of times then leave whether you win or lose - but don't forget your winnings! Make sure you read the instructions on any machine. This includes the pay out information. Check out the jackpots and progressive games to find the best possible return for your investment. Be sure you have cashed out all your credits on a given machine before you leave. Make sure you collect your total winnings before you leave a machine. Sometimes on large payouts, you may have to collect a portion of your winnings from an attendant. Sometime casinos will set up a few machines that payout more frequently than normal in order to attract people to the casino. If you can find and get on one of these "hot" machines you stand a much better chance of winning. If you win at a machine and its paid out by an attendant, do not touch the machine, don't allow anyone else to touch it and don't put any coins in it until the attendant pays out the winnings. Many casinos offer "comp" cards that entitle the owner to freebies like meals, drinks and even tickets to shows and accommodations, if you are a high roller. Your card will keep track every time you drop a coin and give you credit for it. Never gamble to increase comp credits. If you can play the higher denomination and higher payout machines rather than low denomination machines with smaller but more frequent payouts. Video poker usually pays out better than slots. Don't stick to one machine because you feel its due for a win.